“Strangetown” and “Veronaville” are towns premade by the creators of the Sims2 games (ie. AldoHyde did NOT create these two towns or their characters or backstories). What AldoHyde DID create, is his own version of what happened to these two towns and their characters, ie. this bizarre scientific conspiracy / psychological drama called StrangeTown Monty (STM). This story is very different from the usual kind of Sims videos you find on YouTube, mainly because its author does not fit the usual demographic of Sims storytellers / machinima directors. (The Sims2 neighborhood) Veronaville is a Shakespearean parody, where rival clans Monty (Montague) & Capp (Capulet) have been feuding for decades. All Veronaville characters are named after characters in Shakespeare’s plays, with some changes in the family structure (eg. Tybalt is Juliet’s cousin in Shakespeare, but is her brother in Veronaville). There IS literally a “Romeo Monty” & “Juliette Capp” in Veronaville. But in STM, this teenage couple, together with most of the Montys & Capps, die in a bizarre chain of events known as the “Veronaville Disaster”. Of the survivors, the only two adults are the 30-ish Monty siblings, Antonio and Bianca. Both these names correspond to multiple characters in Shakespeare, where Antonio Monty could be modeled after the “Merchant of Venice” or the old gentleman in “Much Ado About Nothing”. But Bianca Monty has less in common with her Shakespearean namesakes, since AldoHyde sees her as a liberated woman of the 21st century. 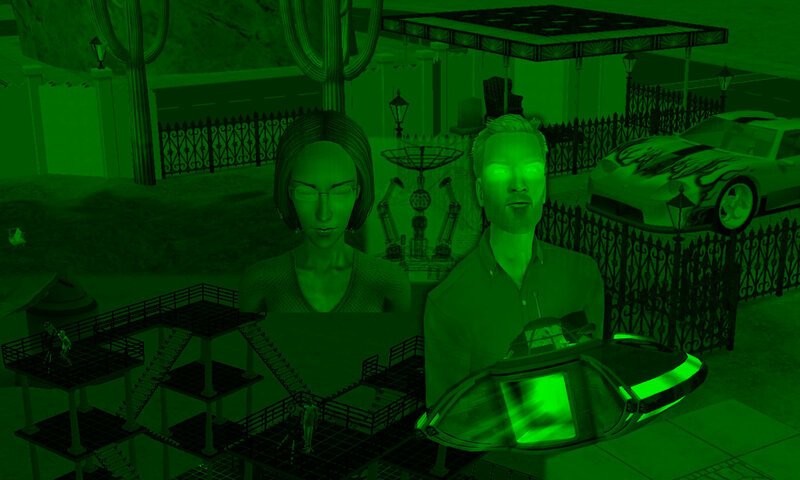 (The Sims2 neighborhood) Strangetown is the science-fiction isolated desert town featuring aliens, scientists, mysterious phenomena and missing people. If Bianca chooses Strangetown, she is NOT seeking the comfort of a “normal” town. Examine Bianca’s attitude towards the residents of Strangetown, and how she may find the answers she is looking for. Meanwhile, Antonio is left in Veronaville with a seemingly impossible task. 1. A Strangetown resident, “Nervous Subject” / Nick Grimm, a damaged victim of unethical scientific experiments. 2. Bella Goth / Jane Doe, a missing person from another pre-created town, Pleasantview — somehow ends up in Strangetown. Two Strangetown residents try to help her return to her former life. How the *Fringe* did the Shakespeare neighborhood get involved with the bizarre phenomena in the science fiction town? Watch to find out.